JER-DEN Plastics offers a variety of secondary manufacturing services, including hardware installation, to provide the quality rotational molded parts and finished products you need – rapidly and affordably. As a “value-added” supplier, we can lower your costs – and reduce your time to market- with our efficient in-house hardware assembly services. We offer a wide variety of assembly methods in order to provide our customers with the best options for structural benefits, cost savings, and rapid, efficient final assembly. The various hardware assembly methods we have available gives us the flexibility to design an assembly solution for you based on your parts’ unique size, complexity, fit, form and function. Having multiple assembly options available also enables us to custom tailor a hardware assembly solution for you that meets your budget and your time frame. Keeping your hardware assembly process in-house allows our experienced manufacturing team to retain complete control over quality and timely delivery – ensuring that you receive the best product in the shortest time. Jer-Den Plastics offers state-of-the-art hardware installation equipment and techniques, and a skilled staff that is experienced in all aspects of hardware installation. To keep our hardware installation costs to a minimum, we utilize manual insertion as well, depending upon your needs, your budget and your time constraints. We work with many various industries that require different types of hardware assembly, in order to meet their particular industry’s standards. We understand – and will meet or exceed – the safety and regulatory compliance requirements of your specific industry. When we handle your rotational molding project, we will consider the installation of the hardware from the very first step of engineering and testing your design. This ensures that when assembly time comes, we are perfectly positioned to offer the most appropriate, fastest, easiest and most cost effective assembly process for your project. Additionally, our centrally located geographic location in the Detroit area allows us to efficiently deliver assembled products across the Midwest – and on either coast – rapidly & cost effectively. 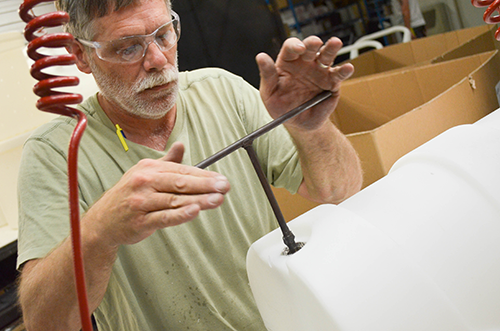 Utilizing Jer-Den for your rotational molding / hardware assembly needs will improve the quality of your final product, reduce overall production time, lower your shipping costs and speed up production. Contact Jer-Den Plastics today to discuss your rotational molding and hardware installation needs.